Posted all available editions of Hazelbaker News and Updates, 1986-1994. Posted first volume of newsletter, "The Hazelbaker News" of 1985. The rest to follow. Trying to get started again. Keep watching. First attempt to orgainze photos of actual church records from Münchsteinach. Roll mouse over names to see which ones live. My best family tree of that generation. I acquired WWI military maps of the Western and Eastern European fronts as of June, 1916. These are as detailed as I have seen and were helpful in interpreting my grandfather's wartime diary. Haselbachers of Burgenland on the Haselbach stream. I make another attempt to learn about the Veilhof or Feylhof after which modern Veilhofstraß is named. My father was born on that street in Wöhrd, Nürnberg. Other New York Haselbachers. Ferdinand from Austria, and Frank, guitar-maker of NYC and Volutown, CT.
A descendant of the New York Grocer, Frederick Hasselbach sent new information. Updated the information about Burghaslach, the family of the Miller Georg Lang, and the history of the mill there. Documents partially translated. John Haselbacher, stonemason of Michigan and Tennessee. Who is he? Civil War veteran. Had a large family. I added an additional old post card and modern photo of Gresten, Austria. Introduction to the Family of Wolfgang Peter Hasselbacher of New York City of the 1800s. I discovered a new document from 1802 proving that Peter Hazelbaker was indeed born in Münchsteinach. Added two new postcards of old Gresten, Austria. I discovered records in Burghaslach linking Georg Lang, the father of Peter Hasselbacher/Hazelbaker to a mill in the village. A possible link with the Hasselbachers of Stübach and Rehweiler is suggested. I have begun to organize the church records of Hasselbachers from Diespeck beginning with the descendants of Johann Georg Hasselbacher who sent several grandchildren to America. 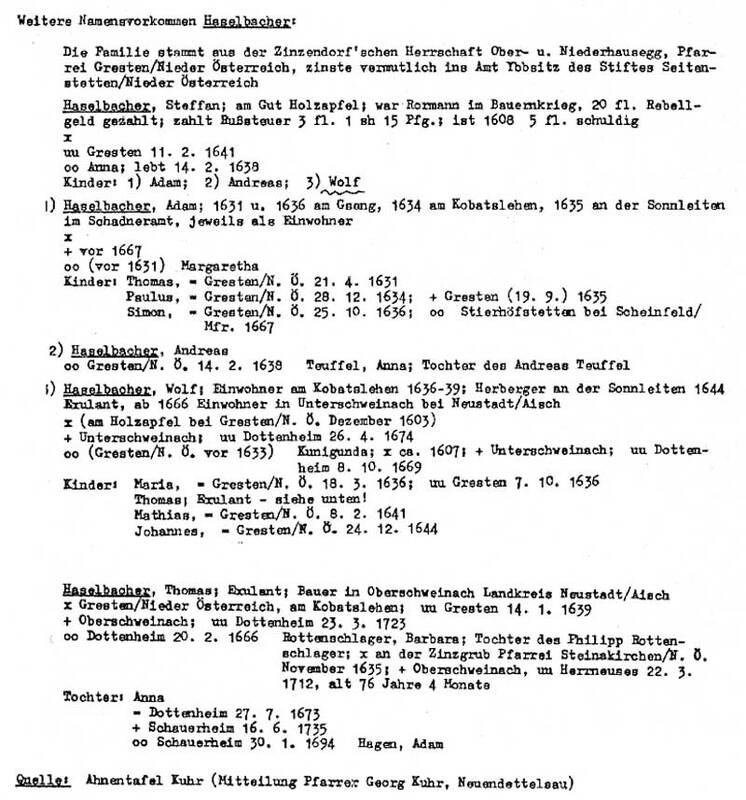 An introduction to Großbreitenbach and records of the Römhild family. Returned from trip to Germany. Lots of new information. Check the Blog for summary and updates. Greg Humphrey has turned up more new information: the passport application of Hazelbaker historian L.B. Kinney. See what it means. Map and Directory of Allen Township, PA dating from 1876. The old Hazelbaker holdings in this ancestral place are shown. Peter is buried here. Legal notices of the bankrupcy of my 5th GGrandfather Johann Georg Hasselbacher of Diespeck. He is the grandfather of Andreas whose own legal troubles are described in the item of 25 Dec below. Interesting story gets even more interesting. I placed an audio-visual supplement on YouTube with additional material in support of my "Tale of Three Taufbecken." See 31 Oct below. Re-count of places named Hasselbach and Haselbach in Germany. I updated the analysis of the distribution and spelling of the variations of the names Hasselbacher and Hasselbach in Germany and Austria. I had some fun trying to identify the location in an old photograph of my Grandparents Hasselbacher taken c1916 in Nürnberg/ Wöhrd. Take a little tour of old Wöhrd and the Pegnitz River. Multimedia! The butcher Alexander Hasselbacher of Newark in 1910. I am adding miscellaneous Hasselbacher-related families to the Family Line Page. Take a look there from time to time. Found reference to what may be a Jewish Hasselbacher Family line in the Aischgrund heartland. Three families or people from Vestenbergsgreuth. Found announcement in a German newspaper of the emigration of Johann Peter Hasselbacher to America in 1857. He and Eva Marie founded the large Illinois line of Hasselbachers. I also found the couple's passenger list. A family member contributed their grave marker. There were Haselbachers in Munich in the early 20th Century. Where did Wolf Hasselbacher and his family first live in Mittelfranken? I summarize the evidence and discuss the possibility of Birkenfeld. I climb the tower of the Münchstein church to view the work of Hasselbacher craftsmen. The story of Balthasar and the Münchsteinach Hasselbachers is expanded. The discovery of three related Baptismal fonts (Taufbecken) in the style of the one in Münchsteinach. Balthasar Hasselbacher plays a role. I found an old map of Passau that identifies the Haselbach stream running through Haselbach Germany giving further weight to the concept of a geographic orign of our name. 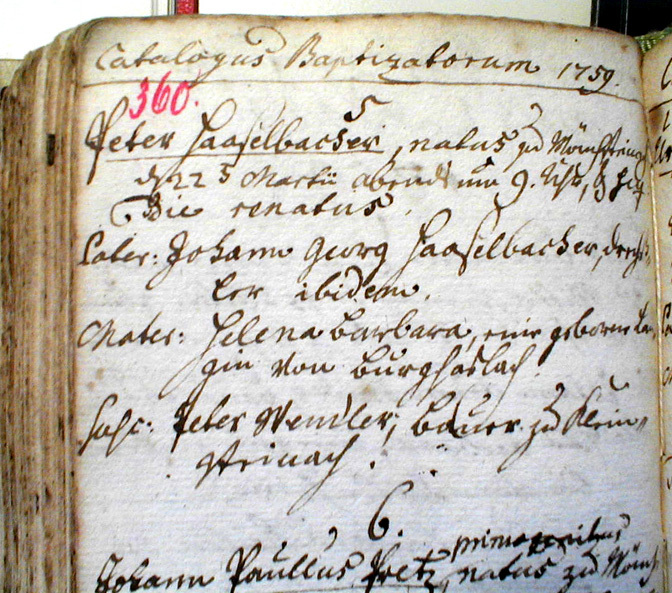 Death record of Paulus Hasselbacher in 1750. The first fruit of my recent trip to Germany. Many other original records to come. Four newspaper articles in German from 1953 celebrating the 60th anniversary of my Great-grandparents Johann & Maria Hasselbacher. I am asking the church in which they were married where there records are kept. I continue to add material about the emigration history of the Eckers and the history of the village and mill in which they lived in Germany. Keep returning to look. More emigration records. I present historical evidence explaining the likely reason my mother's Ecker family left Unterreichenach, Germany in the 1850's. Crop failures and flood. I post excerpts from a letter from the eminent Haselbacher descendant and scholar, Pfarrer Georg Kuhr. He states his conclusions of how we got our name. I present some references to the physical stature of the conscripted German soldiers of the American Revolutionaly War that relate to the story of how Peter Hasselbacher the First, came to America. Buried within a manuscript by Wolfgang Martin that I could not previously understand is fascinating information about a Hasselbacher in Ansbach and how the Separatist movement further altered the lives of the family. As part of my German lessons, I took a crack at translating the comments of Hermann Schöberl relating to the old Gersten Church Records. He identifies the family names that were derived from the house or farm names. I had some fun with some miscelaneous topics. Learn about the best beer ever. Find the wild boar killer in our past. Visit a village named Haselbach in Germany. Interactive Family Tree now presented in two versions: a public version with limited information, and the complete version available to Hasselbacher family members by registration. Newspaper clipping about Ella Hazelbaker of Washington Co. PA. I have been adding material related to my Bayerl family in southern Bavaria. I began a more formal analysis of the Church Books of Edenried by counting the total number of births and marriages each year. What does our name mean? Check it out here. Began to enter material about the Gnugessers of Affing and Deggingen. I started a page to collect family registers from Old Family Bibles. The first is that of Andrew Jackson Hazelbaker of Ohio, born 1856. By coincidence, I recently posted the civil war pension records of his father William Riley Hazelbaker. Photo gallery of Altheim, an early place of worship of Hasselbachers in Germany. Bayerl family gravesites and old map of Affing area. 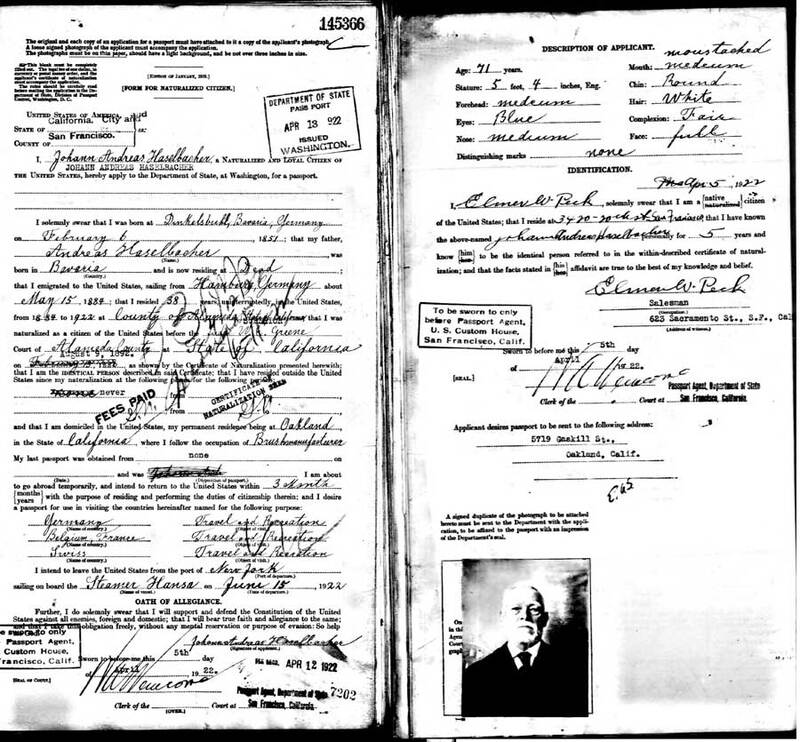 WWI military records from Germany including Hasselbacher, Bayerl, and Gnugesser family members. I begin to consolidate information for individual people. The first is for Wolff Hasselbacher, our early ancestor in Austria and Germany. There is a more general disussion of the old records and the move from Austria. Map of Wolff's emigration. Information about the military history of Peter Hasselbacher 1777-83, and documents from the thesis of Erhard Städtler. How Peter must have met Elisabeth. See also the Blog for other new information and commentary. I placed all the slides of my August presentation about the pre-American history of Peter Hasselbacher (1753) on this website. How the Hasselbachers got their name. Hasselbachers left behind in Gresten, Austria! Civil War Pension records for 11 Hazelbakers. Rediscovery of the original house of the Hasselbachers in Münchsteinach. Discussion of where Peter actually came from. Discovery of original muster list from 1777 containing Peter's name in Ansbach/ Bayreuth Regiment. I began a review of church records from Stierhofstetten, Germany where Simon Hasselbacher migrated. Simon was the son of Adam and was born in Gresten. The longevity of this family line is unknown. You can now generate PDF reports from screens within the Interactive Family Tree database. These can be printed and saved to your computer making it easier to extract information. Added instructions for edits to family trees. Hazelbaker Family Tree data updated. More information about the Bayerls of Haunswies and Edenried. Posted much material about the Baÿerl Family of Edenried. My 5G and 6G Grandparents. Have been doing a lot of work on my Helfer ancestors, back to my 8G Grandparents. The Hasselbacher Family Tree Database was updated. A presentation about an old painting of Nürnberg that hung in my Greatgrandparent's home in Germany. A spectacular addition by Craig Hazelbaker who has found the grave of his family's patriarch (and my distant cousin) , Peter Hazelbaker, born Hasselbacher in Münchsteinach, Germany. To my knowledge Craig is the first to have made this wonderful discovery! I migrated this site from hasselbacher.us to hasselbacher.org. At the same time I added several thousand names to the Hasselbacher and Hazelbaker family trees. Updated the Hasselbachers of the World in the Interactive Family Trees on the server. This includes newest information about the Austrian Hasselbachers, my father' Bayerl maternal line, and my mothers Ecker and Römhild families. 1724 names. Does not include the Hazelbakers. I have begun to study church records from Affing, ancestral home of the Baÿerls. Finished adding photos and information about the Hassselbacher homesteads in Gresten. Good bit of information about the origins of the Baÿrl family and the spelling of their name. Began presenting new information about my paternal grandmother's family, the Bayrl or Bayerl family. Original documents are offered. Posted most what I have of Original Church Records from Gresten Austria. Greg Humphrey has expanded his analysis of US Census data for the Hazelbakers of Pennsylvania to include 1850 through 1880. I also added some new information about the Hasselbachers of Dinkelsbühl- the "California Hasselbachers." Starting to post information gathered suring my April trips to Germany. Starting with maps and locations of Ancestral Farms in Gresten. Keep an eye on this as it grows. Family historian Greg Humphrey has contributed another wonderful piece of scholarship to our site. He collected, abstracted, and analyzed Old US Census Reports from Pennsylvania for the years 1800 to 1840. I have begun tackling a massive backlog of actual old records and their translations. I start with a collection of 17th and 18th century Church Records from Austria and Franconia that have been authoritatively transcribed into modern German by experts. This is a work in progress. Old postcard photos of Gresten, Austria from 1906 and 1917. I posted some video clips of the village of Oberrossbach in different formats and quality. Please take a look and help me decide on a format and quality to use for other videos. I really need your help on this. You can also use the blog to report if you wish. Also posted some still photo galleries of Oberrossbach, Unterrossbach and Unterschweinach. Posted an Audio/Visual presentation about the Exodus from Austria. Began to add maps and photos of the ancestral villages around Oberrossbach. I also found a passport application of Andreas Hasselbacher of Oakland and a source for church records of the Hasselbachers of Dinkelsbühl. New Year's Greeting and apology on the Site Blog. I am trying to ramp up the use of the Blog Function of this site. Take a look at "On Spellings and Origins." Definitive identification of the Hazelebaker historian (letter-writer and family member) Louis Beebe Kinne, submitted by Greg Humphrey. Nice historical sketch of Johann Peter Hasselbacher who settled in Rosefield Township, IL and founded the Illinois Hasselbacher line. There is a shorter directory entry attached. Very useful material here including the fact that he had a brother-in-law there already. Also a few pages from a history of the Hasselbach family of Germany and Ohio. I know nothing else about them. See also the overview page. Added a family history of the Hazelbakers of Washington Co. Pennsylvania and a census of a church cemetery containing Hazelbakers. Some interesting stories. Jill also contributed the Will of George H. Hazelbaker, one of Peter the Elder's sons. I also post a proposal on the Home Page submitted for a Hazelbaker Family Reunion in 2009 to commemorate the 250th birthday of Peter Hasselbacher the Elder. Hazelbaker historian, Greg Humphrey, has contributed a very nice comparison of available primary sources of information about his family patriarch, Peter Hazelbaker. There are also links to the original documents and correlations to US Census reports. The publication of a new book prompted me to examine in more detail the immigration documents of some of our cousins from Diespeck. As is always the case, I learn more about what it must have been like to live in those times. The accomplished Hazelbaker historian, Jill Hazelbaker Foley, has contributed an analysis of certain historical documents that are the source of the most commonly quoted family lore related to Peter, the first Hazelbaker in America. I predict that most of you will be surprised. The original documents are also posted. Jill reminds us how important it is to inspect and re-inspect original source materials. She (and I) are interested in what you have to add. Contact us directly or use the Blog Function of this Website. I use this occasion to restate my heartfelt request for those of you with old family documents and photos to share them in common cause with the rest of our family. A newspaper report about the life and trials of Balthasar Hasselbacher. Some help with the translation of this modern German is requested. Copies of some actual church records (birth, death, marriage)related to Balthasar Hasselbacher are referenced from the discussion and posted here. Somehow the Hasselbachers of the World interactive family tree database became corrupted and only a handful of names were present. It may have been that way for a while as I was out of town. Sorry. It goes without saying that I hope you will inform me when there appear to be technical problems with the site. A modern Hazelbaker descendant, Mark Hazelbaker, recently returned from a trip to Münchsteinach and prepared a booklet for a family reunion. It describes the religious and political forces that led to the immigration to Germany from Austria in the mid-1600's as well as presenting us with some recent photos of modern Münchsteinach. I hope others will consider contributions to the content of this site as well. Contact me with your ideas. I added new pages to post old family photos from Germany in which I cannot recognize the people or places. I am in hopes that some one else will recognize possible family members. I plan to translate the text into German as well. Ich habe hinzugefügt, dass neue Seiten aufstellen alte Familienfotos von Deutschland in den ich die Leute oder der Orte nicht erkennen kann. Ich bin in Hoffnungen, die einige Ein sonst möglicher Familienmitglieder erkennen wird. Ich plane, den Text in Deutsch ebenso zu übersetzen. Added my working notes in both the Interactive Family Tree sections and the Web Cards section. Having these fields available gives the viewer an idea of the sources of information used in this site and also provides me a place to put translations of the original documents without having to load all the primary images first. Added a huge Hazelbaker Family Tree courtesy of Mr. Jack White. I think this is the largest yet available on the internet. Please offer your additions and corrections. Added some new maps of Emskirchen region. This is where the Illinois Hasselbachers came from. Also added a list of missing Hazelbakers courtesy of Jack White. Can you help us find these folks place in the family? Added an interesting story about my Nürnberger Grandfather to the "Interesting or Fun" section. Added records of 55 Births, 12 Marriages, and 22 Deaths from Church Records in Diespeck dating from 1733 to 1875. I am still wrestling with the technical aspects of adding such individual documents to this site. Let me know what you think of this attempt. Also adding original files and discussion for selected individuals. (Example) For now the links are adjacent to the names in the Diespeck records above. Included the complete text and a poor-man's translation of the wonderful article by Pfarrer Bacigalupo about Balthasar Hasselbacher of Münchsteinach. Made updated Hasselbacher Family Tree Graphic of first 6 generations of Franconians. It's too large for most printers but is a pdf document that you can scroll. I needed something to print to help me work out and pencil in relationships for additional data. Can you believe there is even more! Do you know where you fit in? Learning how to use my genealogy software better. Merged the family trees of the Illinois Hasselbachers with the parent tree of Franconian Hasselbachers in both the Web Card and the Interactive Tree sections. Moved all the separate family-line links on the home page into a single link (Family Line Information) to make more room for new material. I also added the full text of Fritz Hasselbacher's "Durch 4 Jahrhunderte auf den Spuren der Haselbacher." Also updated both major interactive family tree functions. I accidentally met a distant relative in Germany last month who had wonderful information about the earliest maternal family lines back to the 1500's. Unbelievable! Added audio file of native German speakers pronouncing our name. Added material found in Dinkelsbühl related to the Haselbachers of California. Added a Comprehensive Listing of the early Hasselbachers and my family line in a simple format. It has both family and individual "web cards." This is an alternative to the Interactive Family Tree function which has the same information, but is able to draw charts and has a search function. Both options have privacy filters engaged. Just returned from Germany with a cartload of information. Will be adding material for weeks. Keep an eye on this page. For starters are some treats for the Hazelbakers. Balthazar Hasselbacher was a productive woodcarver. The family home in Münchsteinach is shown. Also photos of Emskirchen and its war memorials, one of the villages of the Illinois Hasselbachers. I added material to the previously empty "About This Site" link. Also added several graphic family trees: my pedigree on the "About" page, and several on the Münchsteinach pages. A graphic of the Earliest Hasselbachers is there as well to show better how we are connected. Peter Hasselbacher/ Hazelbaker's ancestry is also charted. I finally figured out how to merge the old with the new Interactive Family Trees. "Hasselbachers of Franconia" is now the main tree. Reproductions of church records and photographs from the church in Münchsteinach are added to the Münchstainech/ Hazelbaker pages. Maps of modern Gresten, Austria with location of old homesteads and the view. As promised, I merged the Münchsteinach Tree with the rest of the early Hasselbachers of Franconia (and Austria). This eliminates duplicates and makes it easier for me to update. The Diespeck Hasselbachers and their descendants are still in my "Peter Hasselbachers Family" Tree. Present the family link between the Münchsteinachers and Diespeckers: the Hasselbachers and Hazelbakers. Added item in "Interesting and Fun" about pronunciation of our names. Added Munchsteinach Tree to the "Interactive Family Tree" pages. This is my best judgment so far, but I have no documents (yet) to confirm. I will fill this in on my return from Munchsteinach next month. Also rewrote the Munchsteinach page. Added a new American Hasselbacher Family from California. Added some original documents to the Nebraska Hasselbacher pages. This includes examples of Diespeck birth records. Introduction to Fritz Hasselbacher's "Four Centuries of Hasselbachers" on Home Page link. Added 1883 historical Ravenstein maps. Page with links to other websites of interest to our families activated. Detailed village maps of 1828 Diespeck and Munchsteinach added. These are of interest because the actual house numbers can be made out. Let me know if you have trouble viewing. Added some photographs to the "Photos" section. Please feel free to contribute your best old photos. Email me below. Added more material about the Pennsylvania/ Munchsteinach Hasselbachers.